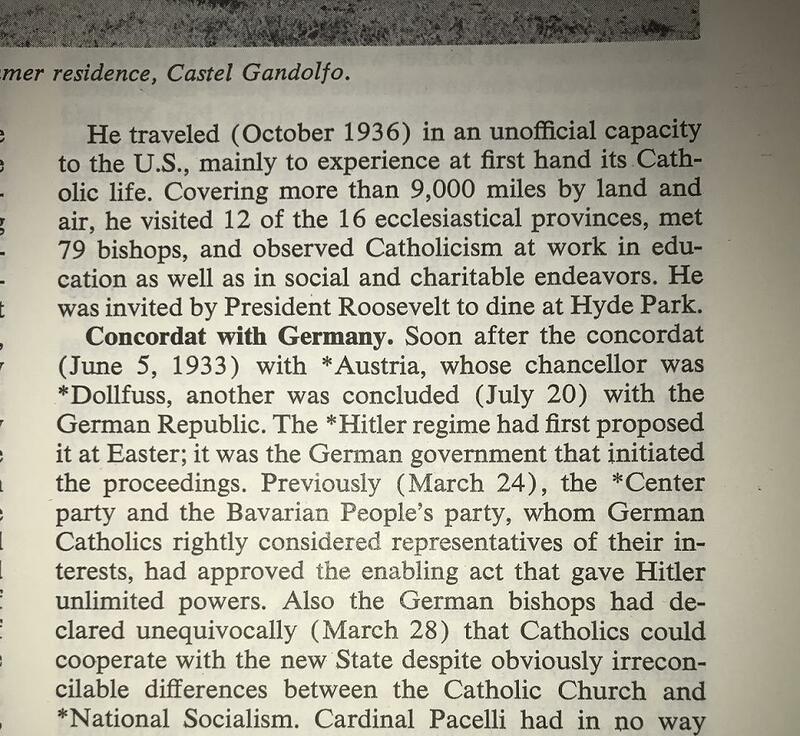 Considering what was known about Hitler in 1933, why would German bishops declare that Catholics could cooperate with the new State? Partially prompted by this other question "Were Hitler's anti-Jewish sentiments known at all to those who voted him to power in 1933?" According to the information in above question, the antisemitism and private death squads of the Nazi party were already public knowledge. Soon after the concordat with *Austria, whose chancellor was *Dollfuss, another was concluded (July 20) with the German Republic. The *Hitler regime had first proposed it at Easter; it was the German government that initiated the proceedings. Previously (March 24), the *Center party and the Bavarian People's party, whom German Catholics rightly considered representatives of their interests, had approved the enabling act that gave Hitler unlimited powers. Also the German bishops had declared unequivocally (March 28) that Catholics could cooperate with the new State despite obviously irreconcilable differences between the Catholic Church and *National Socialism. The bishops that unequivocally declared that Catholics could cooperate with the new State were Catholic bishops; the declaration was adopted in the Fulda Bishops' Conference (Fuldaer Bischofskonferenz) on March 28, 1933. The Center (Zentrum) party mentioned above as having approved the enabling act was a denominational Roman Catholic party. At the time of this declaration, the person who would later become known as Pope Pius XII was known as Cardinal Pacelli. Priests are henceforth forbidden from joining the Nazi Party. Moreover, Nazi flags and uniforms are prohibited during Catholic church services. Considering what was known about about National Socialism at the time, and the stance of the Catholic Church until 1933, what were their reasons for this seeming u-turn in adopting this declaration? It was the exact facts you mentioned in your question. The catholic church considered Hitler dangerous. He had proven that he would be a ruthless enemy if provoked. And now, by dismantling the German Weimar Republic, he had gained absolute power. He was more dangerous than ever before. An enemy that is known for religious discrimination and death squads surely is an enemy you want to make peace with if you are a religious institution unable to protect your people from his power. So in short, the concordat was a move to protect church parish and property from Hitler's now absolute and unrestrained power. You can certainly argue over the moral dimension of this move. When is it morally justified to save yourself (Catholics) when you know others (Jews) will suffer? That's not an easy question. But that's the turning point you spoke of: the moral high ground of denouncing National Socialism vs the (rightly or wrongly) perceived need for self-preservation. The timing was only logical. You try to save your own hide, when your enemy gets so powerful that you fear for your own safety. And again: a tyrant ruler tearing down the republic and turning it into his own pet dictatorship certainly is a good reason to be afraid. Not the answer you're looking for? Browse other questions tagged nazi-germany catholic-church or ask your own question. Was the idea behind what would become the Holocaust planned by German elites in that time? What was the civil weapons legislation under Hitler? Where did Hitler get the funds to invest in economic development programs such as the autobahn when the German economy was in a depression? Could German citizens visit Japan during the Nazi era? And if so what would the locals think of them? What was the planned line of succession for the Nazi Party in the event that Hitler died? Hitler claimed that the Jews sabotaged Germany. What did he think were the Jews' motivation for doing so?